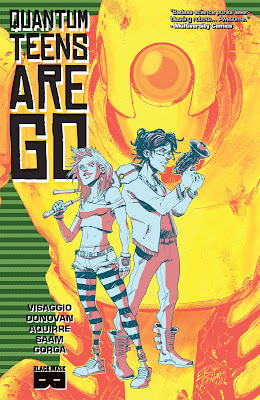 Originally published in February 2017, Quantum Teens Are Go is a four issue story that is now being released in trade paperback format by Black Mask Studios. It tells the story of Nat and Sumesh, two teens who have found love in a futuristic society and their struggles dealing with the typical pressures and angst of being a teenager, while also battling robots, thugs, and beings from the future. It’s a wholly unique book that intelligently blends teen and gender issues, the sci-fi genre, and punk rock. Quantum Teens is a wonderful comic that ends up being the equivalent of taking Peter Parker and his daily battles with high school pressures and evil villains, turning him into a punk rock transgender version of Tank Girl and adding some crazy futuristic technology and time travel into the mix. Written by Magdalene Visaggio (Kim & Kim), Quantum Teens is an interesting story that takes contemporary topics and issues and tosses them into the sci-fi genre. This alternative futuristic society takes place sometime in the future, after a quantum bubble burst, leaving abandoned warehouses full of all sorts of technology just sitting around not being used. Nat and Sumesh spend their nights breaking into these warehouses to steal parts for a time machine that they are building, both looking to escape the world that they are living and struggling in. Each of them are suffering through their own personal conflicts, looking to each other for support and love. Nat, formally Brandon, is transitioning into a woman, dealing with parents who do not accept her and kids in her school that reject her. Sumesh is having a hard time coping with his parents’ deaths and the new family that he is forced to live with. It’s a story that many people can relate to and enjoy, regardless of their sexual preferences or gender. The art from Eryk Donovan is loose and playful and perfectly embodies that punk rock style and attitude that the book is presenting, reminiscent of a slightly grittier version of Tank Girl. The figures and their facial expressions are all drawn in a style that is far different than the typical mainstream comic book, with thinner bodies and more angular heads. Heavy black shading is limited to panels that focus on environments or occur during the nighttime, opting to show more attention to the colors. The colors from Claudia Aguirre are vivid and bright, with many panels alternating back and forth between a bright pink background to the standard environments that the characters inhabit. 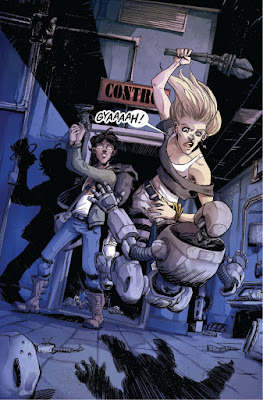 If you like wild punk rock sci-fi adventures that feature teens fighting robots and building time machines, then Quantum Teens Are Go is must read material. It’s a fun adventure that still manages to also have some heart, presenting two relatable characters that you will fall in love with. Ending in a way that enables Visaggio to continue the story and tell further tales of Nat and Sumesh, here’s hoping that we ended up seeing more from the duo.